Computer-generated image of a new ferrorelectric organic crystal. A study by two UNL researchers was featured as a "spotlight" paper by the Journal of the American Chemical Society and highlighted in the April 28 issue of ACS's Chemical and Engineering News. 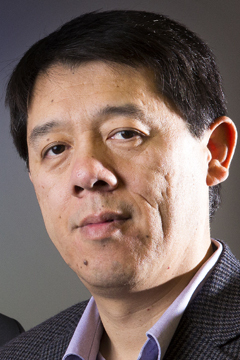 Xiao Cheng Zeng, Ameritas University professor of chemistry, and his current postdoc, Shuang Chen, reported their computational predictions of several new and highly stable organic ferroelectric crystals, one having record high electric polarization value compared to the previous high reported in a 2012 Nature paper by a group at Northwestern University. Ferroelectricity refers to a material property that enables switching electric polarization under the influence of an external electric field. Ferroelectric materials have found wide applications in random access memories, field-effect transistors and sensors. Inorganic ferroelectric materials have been predominantly employed for applications, but increasing attention is being given to light, flexible and non-toxic organic ferroelectric materials for future applications in electro-optical and electromechanical processes. Zeng and Chen designed a computational approach to seek new organic crystals with ultrahigh electric polarizations. They modified the molecules reported by the Northwestern group as new precursors to achieve a more interconnected hydrogen-bonding complex. They then examined tens of thousands of packing structures of the modified molecules and eventually found several highly promising organic crystal candidates. "Large-scale computer simulations are increasingly used to expedite the search of new materials with novel functions — in the spirit of the prevailing Materials Genome Initiative," Zeng said. "The new Crane supercomputer in the Holland Computing Center at UNL significantly reduced the turn-around time of this project from two years to one year." It was the eighth time Zeng's research has been highlighted in Chemical and Engineering News since 2000.